Detail from Fred Williams You Yang Pond 1963. 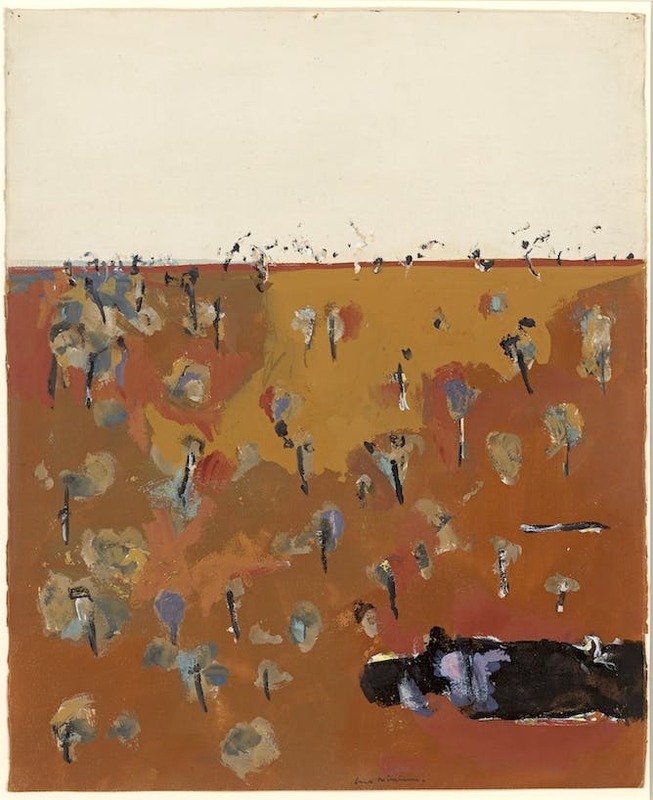 The Fred Williams in the You Yangs exhibition at the Geelong Gallery is neither the first, nor the most comprehensive, exhibition of Williams’s works in the 35 years since his untimely death in 1982. However, its true significance lies in spotlighting a seminal moment in both his oeuvre and modern Australian art. 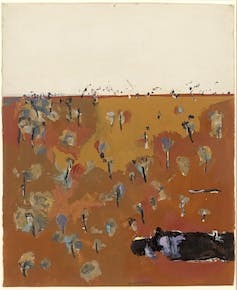 Fred Williams You Yangs landscape 1963, oil and tempera on composition board. The exhibition is situated just 22km from the You Yangs themselves, magnificently visible from the road and rail line on the journey to Geelong. 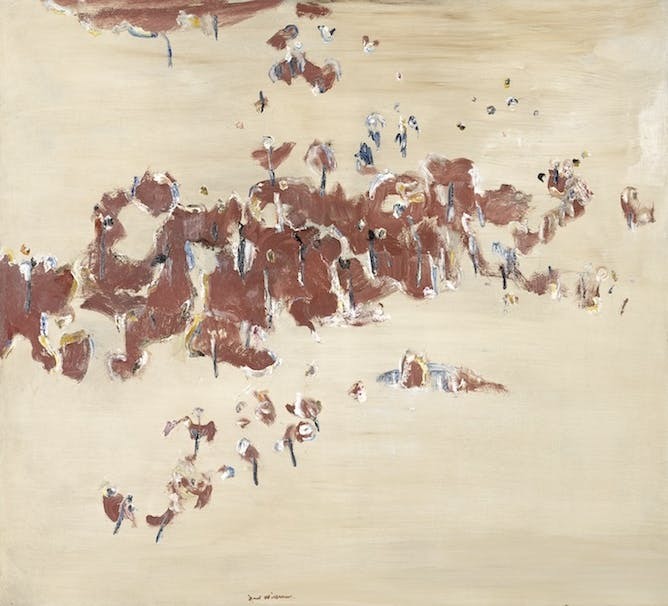 Its specific focus on the more than 50 oil paintings, gouaches, drawings and prints in Williams’s two You Yangs series (1963-64 and 1965-66) illuminates a “breakthrough” moment in the depiction of the Australian landscape and highlights the complexity of his artistic method. 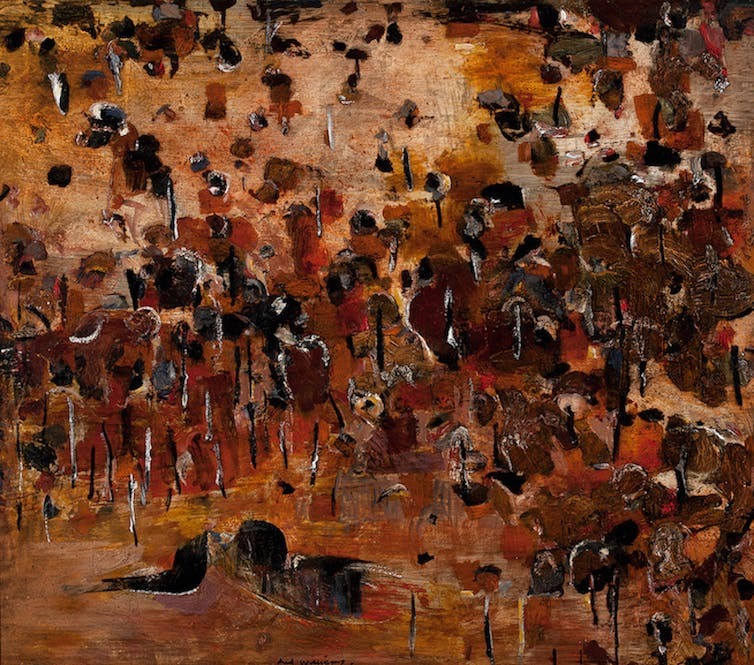 Australian art has traditionally been centred around the landscape and motifs of country. The coming of age of Australian non-Indigenous art occurred when it broke free of the imported European conventions of landscape painting to find a distinctly Australian language. 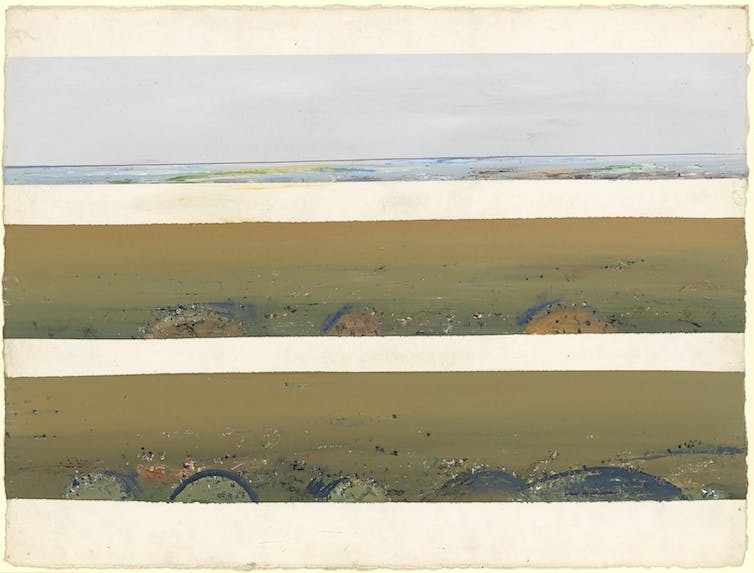 Fred Williams, You Yangs pond 1967, gouache. Williams’s work is simultaneously abstract and representative, classical and modern, formalist and expressionist. Discarding the traditional foreground, middle ground and background of European landscape painting, in the first You Yangs series, Williams frequently dispenses with the horizon line altogether. He flattens the picture plane, adopting an elevated or aerial viewpoint over a scrubby, irregular landscape without a focal point. There is little here that is specific – time of day, time of year, weather conditions – as Williams strips the landscape back to its essence. The viewer floats in what artist Dr Mark Dober has called “the transcendent, a realm beyond the here and now and the everyday”. Although this aerial viewpoint may share some sensibilities with the Papunya dot paintings, Williams’s You Yangs works pre-date these. Rather, they are informed by his exposure to cubism and other modernist traditions, what art historian Daniel Thomas has termed his “greedy art history”, in which he immersed himself while travelling Europe on the Helena Rubinstein scholarship in 1963. 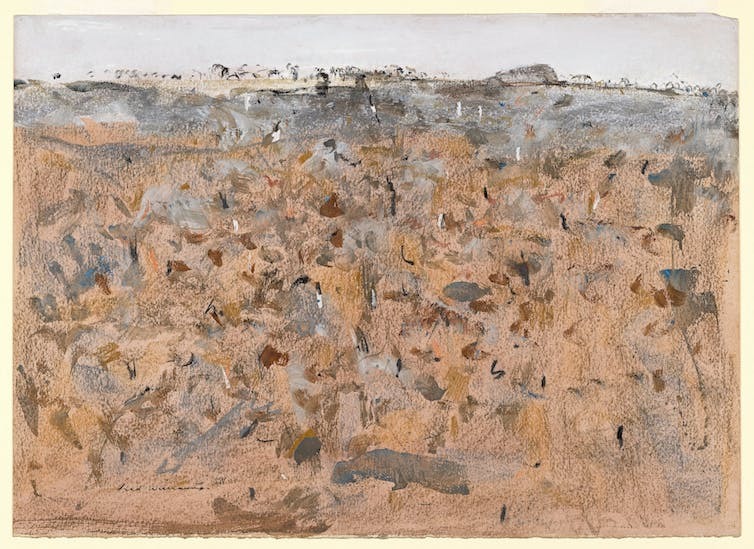 Fred Williams You Yangs landscape 1963 watercolour, gouache and coloured chalks. Williams’s genius lies in his ability to suggest bushes, trees, fence lines and rocky outcrops through calligraphic daubs of coloured paint and scumbling, seemingly arranged as in the landscape itself but here precisely formulated along the axes of geometric grids and structural motifs such as the golden mean, the right angle, the cross and the figure eight. Carefully planned yet surprising placements and recurrences of colour draw the eye around the canvas as if wandering through an immersive landscape. Man is present in absentia, evidenced by the suggestion of fence lines and cleared land. Williams had a deliberate and exacting work method. Once a week, he would be driven out to a favourite location to execute a number of gouaches and watercolours en plein air. Many of these he regarded as unsuccessful and discarded almost immediately. He frequently spent a day preparing, and then a further day recovering from, this demanding work. Fred Williams You Yangs landscape 1965, oil on canvas. Back in the studio, he worked painstakingly from these quick paintings, exploring the compositions in both etching and oils, sometimes over a period of years. An intellectual painter, with each work, he sought to resolve formal problems. One of the highlights of the Geelong exhibition is the sensitive juxtaposition of various views of a favourite knoll in the You Yangs in watercolour and gouache (1963), gouache (1963), charcoal and chalk (1964), aquatint, engraving and drypoint (1963 and 1963-4), aquatint, engraving, drypoint, deep etching and flat biting (1963-4), and oil painting (1963, 1965 and 1965-6). Fred Williams Knoll in the You Yangs c. 1963–64, charcoal and coloured chalk. This allows the viewer to gain insight into Williams’s method of working and re-working his images in a constant dialogue between various media, in each case using different techniques to resolve the image. Williams did not privilege one medium over another and it is instructive to see a selection of the smaller etchings alongside the iconic large canvases. 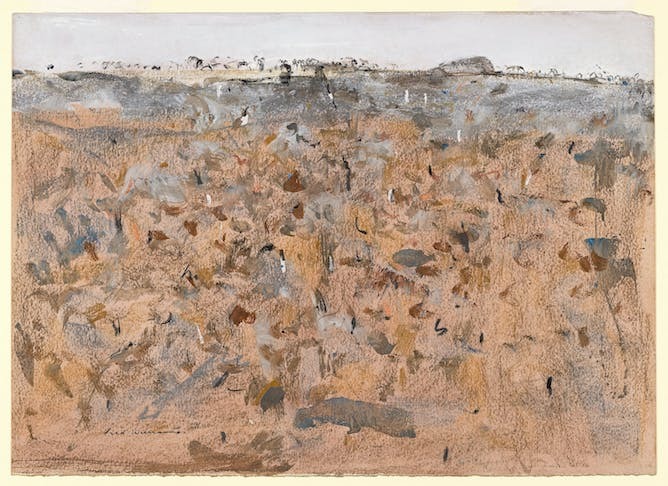 It is almost paradoxical that despite Williams’s abstraction and formalism, not only have his paintings come to be recognised as truly representative of the Australian bush, but many have come to see the scrub as “typical Williams country”. 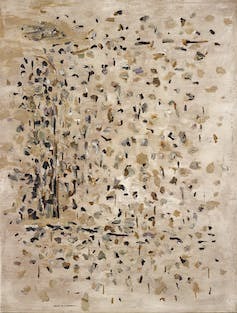 Although the You Yangs series are considered a breakthrough or turning point in Australian art, Williams continued to experiment and evolve throughout his career. In Yellow landscape (1968), a luminous golden painting that beckons the viewer closer, Williams has abandoned his tight geometric clusterings. The canvas glows and breathes and is filled with delicate, apparently random, calligraphic marks. 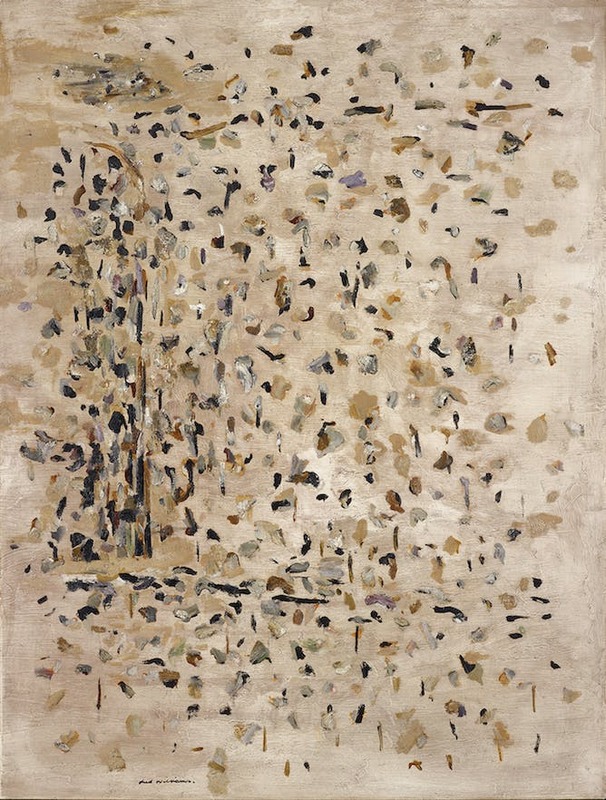 In 1975, Williams was the first Australian painter to be invited to exhibit solo at the Museum of Modern Art in New York and he returned from this and several other exhibitions abroad with renewed vigour and confidence. 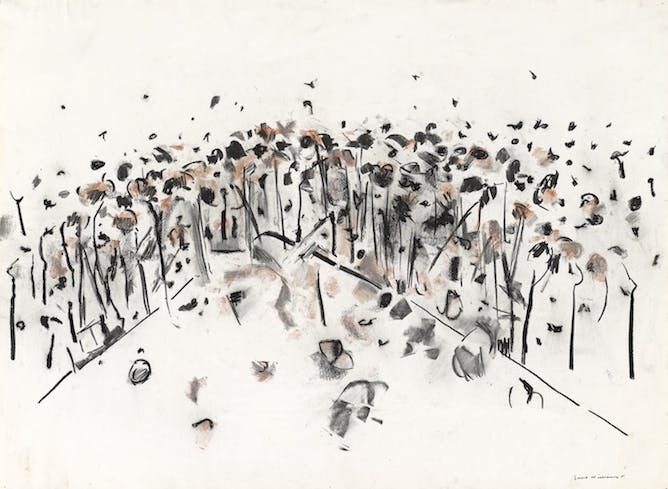 Fred Williams You Yangs 1973, gouache. Williams revisited the You Yangs landscape in 1978, once again with a light and luminous canvas and this time with an opalescent landscape. This later work has a liberated palette and more expressive style than in the earlier series. The horizon has been reinstated and the natural features of the land, while still undefined, are less abstract and more recognisable. the paintings, in fact, show us our century. They record how painting has been regarded, and how art itself is compelled to pay homage to its own traditions. Fred Williams at the You Yangs is at Geelong Gallery until November 5.